Recently, I was having a discussion about poetry with a friend of mine and we were talking about the different poetry anthologies that each of us owns. It got me thinking that I'd love to know what the people here are reading, and I thought we could share our poetry recommendations here. 20th Century Poetry & Poetics - 4th Edition edited by Gary Geddes. This book features a number of poets, many of them Canadian, all fairly contemporary. I find that I can lose an afternoon in this anthology reading old friends and making new discoveries. The latter quarter of the book is given over to essays on the writing of poetry by many of the poets featured in the anthology. Well worth getting. Originally published in 1861, Palgrave's Golden Treasury quickly established itself as the most popular selection of English poems. Today it stands as a testament to the richness of our finest native poetic writing from Spenser, Shakespeare, and Wordsworth, to Tennyson, Yeats, Eliot, and Betjeman. This edition includes a sixth book, prepared by John Press, which covers the post-war years, showing that the lyrical tradition remains strong. Over 90 poets are included, from Dylan Thomas, George Mackay Brown, Ted Hughes, and Philip Larkin to Carol Ann Duffy, Elizabeth Garrett and Simon Armitage. I have an older edition of this anthology but it is a delight to curl up with and read some really fine lyrical poetry. Seamus Heaney and Ted Hughes have brought together an inspired and diverse selection, ranging from undisputed masterpieces to rare discoveries, as well as drawing upon works in translation and traditional poems from oral cultures. In effect, this anthology has transformed the way we define and appreciate poetry, and it will continue to do so for years to come. Unlike other anthologies, The Rattle Bag has organised the poetry in alphabetical order by poem title. This allows poets as diverse as William Shakespeare, Lewis Carroll and Stevie Smith to rub shoulders in the pages of this book. This book is a more traditional anthology, listing poets chronologically from around the 1500s to late 20th Century. It features such poets as Dylan Thomas, Edmund Spenser, and Percy Bysshe Shelley along with many other well known poets. So, what's on your bookshelf? to read all the greats first right? maybe that 70's book burnt me out on poetry books. heres what some of the poems are like. "my love for henry ford"
like i should not be reading or writing. several different books containing the poetry of John Donne. I looked and I have a very new edition of Six women poets. I also have a mahoosive ( ) Norton poetry anthology which I had to buy for my university course and it's full of so many poets it's unreal. "mahoosive" i love that word! Personally I think the Northon anthologies should be part of any writer's library, whether they're a poet, essayist, playwrite, or other type of writer. The Nortons are good aren't they? Large selection of wonderful writers and easy to just dip into and read a bit at a time! One of my favourite books from my university days. I went out and bought the Norton Anthology of Poetry at a used bookstore a few years ago. I don't have any Sylvia Plath, in fact I'm not sure I've even read any of her poetry apart from the one or two that were posted on the Pages sometime ago. Anne Sexton, Elizabeth Smart and of course Sylvia Plath it could be said led tortured lives - maybe that's why I relate! I was trying to ask someone today some questions about why I can't seem to write any more - of course there's more to it than just that. When I got their reply I felt as if my question hadn't been heard in its' entirety. Or perhaps it was just one of those misunderstandings when you're writing to someone rather than talking face to face. Anyway, this communication I was attempting made me think of a certain poem by Elizabeth Smart. It's not in the book I've mentioned above, but I copied it down from a book of her diaries. And the swooning warmth of being loved. And I remembered I was a woman." I think what Elizabeth is writing about here is the surety she had that she wants to be a poet, perhaps to the exclusion of her womanhood. It wasn't easy in 1934 to be a poet, one had to be conscious that what was expected of her was to be a woman and all that that entails. In my mind she's having this struggle within herself between being a poet, and being a woman, which she thinks are opposing forces. "The Nations Favorite Comic Poems" both of which are excellent anthologies published by the BBC. A collection of Second World War poems. "Never Such Innocence" ~ Poems of the First World War. "She Wields a Pen" ~ American Women Poets of the 19th Century. One Hundred and One Great Books in Haiku ~ A flippant attempt to re-write and condence famous works into three lines. I HATE IT ! Actually, I feel bad saying I hate it without providing some samples of its content. Read the following and make your own mind up. If anyone wants this book they can P.M. me their address and I'll post it to them. Where's Audrey ? Who is Petra ? "Poetry Pages ~ A collection of Voices from around the World"
Ven wrote: "The Nations Favorite Poems"
I have this one as well as The Nation's Favourite Love Poems. I really like both of them! ninian wrote: "mahoosive" i love that word! Heehee. Yeah mahoosive is a fun word. I had never seen such a huge book of poetry until I laid eyes on the Norton Anthology. Do you reccommend any good poems from it? It depends, I think on which edition you have. I think it also depends on what poets and poetry you like. Personally I recommend anything by John Donne. Tintern Abbey by William Wordsworth (sometimes also titled Composed A Few Miles Above Tintern Abbey, On Revisiting The Banks Of The Wye During A Tour. July 13, 1798) is another excellent piece. If you're interested in her work, there is a site here Wendy Cope Poetry Archive that features some of her work read by her and a bit of a biography of her. She's fierce about copyright and many websites that have done a "tribute" to her have been asked by her lawyers to remove her poetry. As a result, I shan't be posting any of her work! Each method has its own benefits and detriments. For example, web publishing is the least expensive and has the least prestige but surprisingly it is capable or reaching a much wider audience than most other methods. My site, such as it is, reaches over 30,000 unique visitors a month. Web publishing is, quite simply, setting up web pages to display your work. This is an easy process, even for someone with limited knowledge of web page creation. You can make use of a service such as http://www.blogger.com (free) to create your own site and you simply need to paste in your poems. It is hardly more work than e-mailing. Feel free to view the poetry page I created in 10 minutes using blogger (the actual poems took longer). Subsidized publishing is when you pay someone to publish a book for you. There are many options of varying expense. Print-on-demand services are the cheapest, and http://www.lulu.com has been gaining in reputation among those services lately. http://www.xlibris.com and http://www.iuniverse.com are two other established services. Print-on-demand publishers only print books when they are ordered. This means that you do not have to pay for a set run of books and therefore have little (sometimes no) upfront fees. A more expensive, more established option is to go with a subsidized publishing company that will work with you individually to tailor the book to your vision. The publisher will then print a run of books (100 is usually the bare minimum and 1000 will generally get you a reasonable price-per-book). You pay upfront for the books and you sell them on your own through advertising, readings and whatever other means you can come up with. A new, inexpensive option is to go with a print-on-demand publisher such as lulu.com. 1. Buy books of poetry, especially books by current writers working in the field. 2. Subscribe to poetry journals. 3. Go to poetry readings. Check your local arts publications. Almost any sizable town has readings every week or every other week. This is a great opportunity to meet poets and people who care about poetry. When you go to readings, donate money and buy books if you can. Support the community you belong to. Host a poetry event or organize a reading. This is a way or recognizing the poets you enjoy and a way of promoting yourself in the community. 4. Publish your own poetry journal. Even a web page or a few sheets of paper stapled together gets the word out. 5. Form a poetry circle or group. If you want to swap poetry and criticism with your peers, form your own group. Many local arts publications let you list your group for free. This month I'm featuring a long time ppages member (she joined in 2002!) who has a fair number of poems posted here but manages to slip in and post almost furtively. I've had the pleasure of reading several of her poems and love the images she creates with words. debab says that she is a ferocious reader, but came to poetry later than most, finding that the form of poetry really worked with images in her head. I'm just glad she elects to share these images with us on a regular basis! Please click the links to visit the original topics and leave a response for debab. Alternatively, click here and see all of her work. we skid erratically down the sanddunes. yields the pleasure of warm dawnings. looking for leftover melted marshmallows. changed in the ancient glacial water. that if found, I string onto bracelets. to pick over or savor. sprouting from her family and friends. the crowd for a spectacle of uniformed players. I was to espalier it onto a trellis. and is still expanding taller. leak slow rivulets of sticky sweet-juice. All around, bees hover and bounce like furry helicopters. Time encircles all flesh, pursues it to the exit. instead, a siren-shore pulled him in. locking spirit onto smoky orbits of shifting atoms. hidden in crevasses or transitive verbs. on space as if it senses a sort of absence. as phantom pains jostling in our marrow. I sweat, I curse, it's time to master stress. appears to be a pleasure, so they claim. in clay, the left leg weaker than the right. that slid free verse from my pen? begin again, to count the stresses on my digits. Please visit these and debab's other wonderful poetry! <img border="0" align="left" src="http://www.mbwriter.mb.ca/poetry/graphics/c_hunter.jpg" alt="Catherine Hunter">Catherine Hunter teaches English Literature and Creative Writing at the University of Winnipeg. In addition to her three collections of poetry, Lunar Wake, Necesary Crimes and Latent Heat, for which she received the Manitoba Book of the Year Award, she has published a spoken word CD, Rush Hour, two thrillers, The Dead of Midnight and Where Shadows Burn and one novella, In the First Early Days of my Death. Winner, McNally Robinson Book of the Year Award, Latent Heat, 1998. Shortlisted for the Carol Shields City of Winnipeg Book Award, Where Shadows Burn, 2000. Shortlisted for McNally Robinson Book of the Year Award, Lunar Wake, 1995. Shortlisted, John Hirsch Award for Most Promising Manitoba Writer, 1992 & 1993. I like to think I write for noble reasons like sparking people's awareness of nature and human nature. But often I suspect it's because I love playing with language and the rhythm of language. I love telling stories, love making things and love making things up. It's hard work, but ultimately it's fun to create something out of nothing and to share it with other people. First you have to know who you are and have some understanding of the simple things in life, such as human beings, grief, joy, turtles and paintbrushes. Once you've got that down pat, or once you give up on it, then read. Read the "classics" and read contemporary literature. find the writers you love and figure out why you love them. If you really want to write well, read them again, study them. Then write until you absolutely can't stand it any more. Then rewrite. Then revise. Ask yourself, "What is it I'm trying to say here?" Write some more. Repeat. In the First Early Days of My Death. In the First Early Days of My Death is not easily categorized. Found in the mystery section of bookstores, this diminutive novel can be enjoyed on several levels. On the surface, it works well as a mystery whose premise bears a passing resemblance to Alice Sebold's current bestseller The Lovely Bones. Wendy Li is a young Winnipeg librarian. She realizes she is dead when she finds herself floating among her loved ones, receiving neither acknowledgement nor recognition. She comes to the conclusion that she has been murdered by Evelyn, her husband's jealous ex-girlfriend. Wendy hovers on the fringes of the astral plane, frustrated by her inability to help her earth-bound friends and relatives to see to it that Evelyn is brought to justice; (Signature Editions); 0-92183-387-3; 2002. The Dead of Midnight. Members of a Winnipeg murder-mystery book club get nervous when the frightening events in the books they are reading start to come true, right in their own neighbourhood of Wolseley. Turnstone Press (a Ravenstone book); 0-88801-261-6; 2001. Thriller. Rush Hour (CD). Cyclops Press; 189417708-8; 2000. Poetry. Where Shadows Burn. A young widow becomes terrorized when evidence suggests that her dead husband is stalking her. Turnstone Press (a Ravenstone book); 0-88801-231-4; 1999. Thriller. Latent Heat. Nuage Editions; 0-921-833-55-5; 1997. Poetry. Lunar Wake. Poems about the moon, getting rid of the moon and other things. Turnstone Press; 0-88801-184-9; 1994. Poetry. Necessary Crimes. Poems about accidents, family, writing and other crimes. Blizzard; 1988. Reprinted by The Muses' Company in 2000, 1-896239-60-9. Poetry. Tell me about heaven, I said. while whirling slowed and came to rest. into a jar of soap suds and blew bubbles. the circumference of the sky. I was extremely young. as I passed over it. The eyes of potatoes were dangerous. That's what the other kids said. your stomach turning black inside and bursting. and bloom like stars until they grew heavy with water. to disobey, and apparently I did. stubborn girl there is a man in the backlane, waiting. of his car and something in his lap I'd never seen before. when the bell sounded for the air-raid drill at school. We all ran, though we knew we were lucky children. the sunken lids that made the other kids stare. on the way home, but I ran anyway. red berries, and all of a sudden they looked delicious to me. <img border="0" align="left" src="http://nobelprize.org/nobel_prizes/lite ... heaney.gif" alt="Seamus Heaney">Seamus Heaney was born in April 1939, the eldest member of a family which would eventually contain nine children. His father owned and worked a small farm of some fifty acres in County Derry in Northern Ireland, but the father's real commitment was to cattle-dealing. There was something very congenial to Patrick Heaney about the cattle-dealer's way of life to which he was introduced by the uncles who had cared for him after the early death of his own parents. The poet's mother came from a family called McCann whose connections were more with the modern world than with the traditional rural economy; her uncles and relations were employed in the local linen mill and an aunt had worked "in service" to the mill owners' family. The poet has commented on the fact that his parentage thus contains both the Ireland of the cattle-herding Gaelic past and the Ulster of the Industrial Revolution; indeed, he considers this to have been a significant tension in his background, something which corresponds to another inner tension also inherited from his parents, namely that between speech and silence. His father was notably sparing of talk and his mother notably ready to speak out, a circumstance which Seamus Heaney believes to have been fundamental to the "quarrel with himself" out of which his poetry arises. Heaney grew up as a country boy and attended the local primary school. As a very young child, he watched American soldiers on manoeuvres in the local fields, in preparation for the Normandy invasion of 1944. They were stationed at an aerodrome which had been built a mile or so from his home and once again Heaney has taken this image of himself as a consciousness poised between "history and ignorance" as representative of the nature of his poetic life and development. Even though his family left the farm where he was reared (it was called Mossbawn) in 1953, and even though his life since then has been a series of moves farther and farther away from his birthplace, the departures have been more geographical than psychological: rural County Derry is the "country of the mind" where much of Heaney's poetry is still grounded. When he was twelve years of age, Seamus Heaney won a scholarship to St. Columb's College, a Catholic boarding school situated in the city of Derry, forty miles away from the home farm, and this first departure from Mossbawn was the decisive one. It would be followed in years to come by a transfer to Belfast where he lived between 1957 and 1972, and by another move from Belfast to the Irish Republic where Heaney has made his home, and then, since 1982, by regular, annual periods of teaching in America. All of these subsequent shifts and developments were dependent, however, upon that original journey from Mossbawn which the poet has described as a removal from "the earth of farm labour to the heaven of education." It is not surprising, then, that this move has turned out to be a recurrent theme in his work, from "Digging", the first poem in his first book, through the much more orchestrated treatment of it in "Alphabets"(The Haw Lantern, 1987), to its most recent appearance in "A Sofa in the Forties" which was published this year in The Spirit Level. At St. Columb's College, Heaney was taught Latin and Irish, and these languages, together with the Anglo-Saxon which he would study while a student of Queen's University, Belfast, were determining factors in many of the developments and retrenchments which have marked his progress as a poet. The first verses he wrote when he was a young teacher in Belfast in the early 1960s and many of the best known poems in North, his important volume published in 1975, are linguistically tuned to the Anglo-Saxon note in English. His poetic line was much more resolutely stressed and packed during this period than it would be in the eighties and nineties when the "Mediterranean" elements in the literary and linguistic heritage of English became more pronounced. Station Island (1984) reveals Dante, for example, as a crucial influence, and echoes of Virgil - as well as a translation from Book VI of The Aeneid - are to be found in Seeing Things (1991). Heaney's early study of Irish bore fruit in the translation of the Middle Irish story of Suibhne Gealt in Sweeney Astray (1982) and in several other translations and echoes and allusions: the Gaelic heritage has always has been part of his larger keyboard of reference and remains culturally and politically central to the poet and his work. Heaney's poems first came to public attention in the mid-1960s when he was active as one of a group of poets who were subsequently recognized as constituting something of a "Northern School" within Irish writing. Although Heaney is stylistically and temperamentally different from such writers as Michael Longley and Derek Mahon (his contemporaries), and Paul Muldoon, Medbh McGuckian and Ciaran Carson (members of a younger Northern Irish generation), he does share with all of them the fate of having be en born into a society deeply divided along religious and political lines, one which was doomed moreover to suffer a quarter-century of violence, polarization and inner distrust. This had the effect not only of darkening the mood of Heaney's work in the 1970s, but also of giving him a deep preoccupation with the question of poetry's responsibilities and prerogatives in the world, since poetry is poised between a need for creative freedom within itself and a pressure to express the sense of social obligation felt by the poet as citizen. The essays in Heaney's three main prose collections, but especially those in The Government of the Tongue (1988) and The Redress of Poetry (1995), bear witness to the seriousness which this question assumed for him as he was coming into his own as a writer. These concerns also lie behind Heaney's involvement for a decade and a half with Field Day, a theatre company founded in 1980 by the playwright Brian Friel and the actor Stephen Real. Here, he was also associated with the poets Seamus Deane and Tom Paul in, and the singer David Hammond in a project which sought to bring the artistic and intellectual focus of its members into productive relation with the crisis that was ongoing in Irish political life. Through a series of plays and pamphlets (culminating in Heaney's case in his version of Sophocles' Philoctetes which the company produced and toured in 1990 under the title, The Cure at Troy), Field Day contributed greatly to the vigour of the cultural debate which flourished throughout the 1980s and 1990s in Ireland. Heaney's beginnings as a poet coincided with his meeting the woman whom he was to marry and who was to be the mother of his three children. Marie Devlin, like her husband, came from a large family, several of whom are themselves writers and artists, including the poet's wife who has recently published an important collection of retellings of the classic Irish myths and legends (Over Nine Waves, 1994). Marie Heaney has been central to the poet's life, both professionally and imaginatively, appearing directly and indirectly in individual poems from all periods of his oeuvre right down to the most recent, and making it possible for him to travel annually to Harvard by staying on in Dublin as custodian of the growing family and the family home. The Heaneys had spent a very liberating year abroad in 1970/71 when Seamus was a visiting lecturer at the Berkeley campus of the University of California. It was the sense of self-challenge and new scope which he experienced in the American context that encouraged him to resign his lectureship at Queen's University (1966-72) not long after he returned to Ireland, and to move to a cottage in County Wicklow in order to work full time as a poet and free-lance writer. A few years later, the family moved to Dublin and Seamus worked as a lecturer in Carysfort College, a teacher training college, where he functioned as Head of the English Department until 1982, when his present arrangement with Harvard University came into existence. This allows the poet to spend eight months at home without teaching in exchange for one semester's work at Harvard. In 1984, Heaney was named Boylston Professor of Rhetoric and Oratory, one of the university's most prestigious offices. In 1989, he was elected for a five-year period to be Professor of Poetry at Oxford University, a post which requires the incumbent to deliver three public lectures every year but which does not require him to reside in Oxford. In the course of his career, Seamus Heaney has always contributed to the promotion of artistic and educational causes, both in Ireland and abroad. While a young lecturer at Queen's University, he was active in the publication of pamphlets of poetry by the rising generation and took over the running of an influential poetry workshop which had been established there by the English poet, Philip Hobsbaum, when Hobsbaum left Belfast in 1966. He also served for five years on The Arts Council in the Republic of Ireland (1973-1978) and over the years has acted as judge and lecturer for countless poetry competitions and literary conferences, establishing a special relationship with the annual W.B. Yeats International Summer School in Sligo. In recent years, he has been the recipient of several honorary degrees; he is a member of Aosdana, the Irish academy of artists and writers, and a Foreign Member of The American Academy of Arts and Letters. In 1996, subsequent to his winning the Nobel Prize in Literature in 1995, he was made a Commandeur de L'Ordre des Arts et Lettres by the French Ministry of Culture. <img border="0" align="left" src="http://www.comedy-zone.net/images/peopl ... -roger.jpg" alt="Roger McGough">Award-winning poet, playwright, broadcaster and children's author Roger McGough was born on 9 November 1937 in Liverpool, England. He was educated at St Mary's College, Crosby, Liverpool, and at Hull University. He taught at St Kevin's Comprehensive School, Kirby, and lectured at Mabel Fletcher College in Liverpool and at the Liverpool College of Art. He was a member of the pop music/poetry group 'The Scaffold' between 1963 and 1973. He made his name as one of the 'Liverpool Poets' with Adrian Henri and Brian Patten, included in The Mersey Sound: Penguin Modern Poets 10 (1967). A Fellow of John Moores University in Liverpool, he won a Cholmondeley Award in 1999 and was awarded an honorary MA from Nene College of Further Education. He was Fellow of Poetry at the University of Loughborough (1973-5), Honorary Professor at Thames Valley University (1993) and is a member of the Executive Council of the Poetry Society. He was awarded an OBE in 1997. His most recent book of poetry is Everyday Eclipses (2002). His Collected Poems, bringing together over forty years of McGough's poetry, was published in 2003, and his live poetry album, Lively, is now out on CD. Roger McGough's autobiography, Said and Done, was published in 2005. This month I'd like to feature a poet I've come to enjoy reading but about whom I know very little. Jaysie is a bit of an enigma on the ppages, slipping in quietly, whenever her schedule allows, and posting a few amazing poems and commenting on the work of others. She has a wistful voice in her work, most of her poetry leaves the reader with a sense of longing for a love that has turned out to be not quite what one expected. Please click the links below to leave a response for jaysie. Alternatively, click here and see all of her work. about how brittle leaves behave. because we cannot talk of love. Please visit these and jaysie's other wonderful poetry! 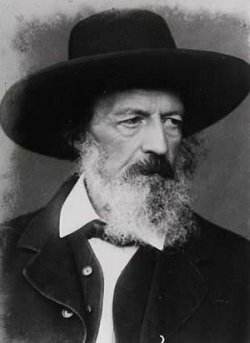 <img border="0" align="left" src="http://www.theotherpages.org/poems/face ... n_a_04.jpg" alt="Lord Alfred Tennyson" width="125" height="172">Tennyson is often regarded as the chief representative of the Victorian Age in poetry, he succeeded Wordsworth as Poet Laureate in 1850. Alfred, Lord Tennyson was born on August 5, 1809 in Somersby, Lincolnshire. His father, George Clayton Tennyson, a clergyman and rector, suffered from depression and was notoriously absentminded. Alfred began to write poetry at an early age in the style of Lord Byron. After spending four unhappy years in school he was tutored at home. Tennyson then studied at Trinity College, Cambridge, where he joined the literary club 'The Apostles' and met Arthur Hallam, who became his closest friend. Tennyson published Poems, Chiefly Lyrical, in 1830, which included the popular "Mariana". After marrying Emily Sellwood, whom he had already met in 1836, the couple settled in Farringford, a house in Freshwater on the Isle of Wight in 1853. From there the family moved in 1869 to Aldworth, Surrey. During these later years he produced some of his best poems. Among Tennyson's major poetic achievements is the elegy mourning the death of his friend Arthur Hallam, "In Memoriam" (1850). The patriotic poem "Charge of the Light Brigade", published in Maud (1855), is one of Tennyson's best known works, although at first "Maud" was found obscure or morbid by critics ranging from George Eliot to Gladstone. Enoch Arden (1864) was based on a true story of a sailor thought drowned at sea who returned home after several years to find that his wife had remarried. Idylls Of The King (1859-1885) dealt with the Arthurian theme. In the 1870s Tennyson wrote several plays, among them the poetic dramas Queen Mary (1875) and Harold (1876). In 1884 he was created a baron. Tennyson died at Aldwort on October 6, 1892 and was buried in the Poets' Corner in Westminster Abbey.